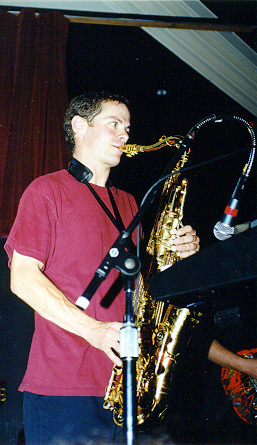 Tenor sax and clarinet is what Clinton "Bär" McKinnon (born in 1969) plays for Mr. Bungle. Clinton and alto sax player, Theo Lengyel, replaced Scott Fritz, the trumpet player, in 1987, after Fritz quit. From then on Mr. Bungle's approach had more of a feel for the vocals and the horns. Bär also plays flute, keyboards, and other woodwind instruments in Trey Spruance's Secret Chiefs 3. Bär works at a loading dock when he's not recording or on tour. Barefoot Hockey Goalie: Bär McKinnon guested on BHG's new album, One Part Thomas Edison, playing drums and bass.